Roundup Pro Biactive. 5ltr. A foliar applied herbicide for the control of annual and perannial grass and broad leaved weeds in amenity and industrial areas. Roundup Pro Biactive has been specially formulated to offer an enhanced standard of operator safety. It is not a hazardous substance as defined by COSHH, when used in accordance with the label. It provides up to 100 fold improvement in safety to some of the most sensitive animal species, when compared to older glyphosate formulations. 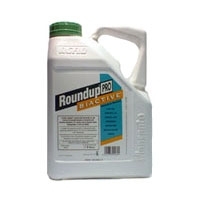 Glyphosate, in Roundup Pro Biactive, controls weeds by blocking the plant enzyme system. For use by certified proffesional users.